It’s not often that you get to chat with someone who is literally a pioneer in their industry, but that’s exactly what we have this week with Dr. Bobby Duvall. Being a golf and fitness centered podcast and platform, we’re very fortunate to have so many great guests that are involved in the world of golf and helping golfers get better at the physical, mental, and performance aspects of the game. Dr. Bobby was there at the start of TPI (Titleist Performance Institute) working with them before they became this huge global golf phenomenon in the medical, fitness and instruction world that we know today. These days, while still serving as a senior member of the board of advisors for TPI, Dr. Bobby Founded and Directed the Discovery Performance Center for Discovery Land Properties, a world-class land developer in the high-end residential markets, until just recently. He specializes in evaluating and developing training-rehab programs for athletes of all levels from Olympians, to amateur, to non-athletes. He joins us today to talk on his story from the early TPI days, what the Discovery Land Properties entail, footwear for the golfer, preventative techniques for back pain, and his work with PGA professionals. 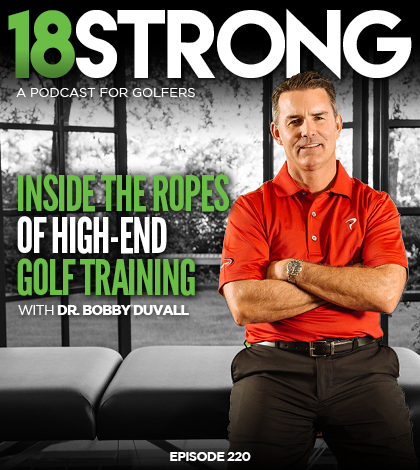 Bobby Duvall is a medical practitioner who specializes in 3-D swing biomechanics, strength and conditioning, manual therapy, rehabilitation, and therapeutic exercises as they relate to golf and other sports. Founded and directs the Discovery Performance Center (DPC) for the Discovery Land Company. His expertise is focused on the comprehensive evaluation of the biomechanical relationships of the human body and developing training and rehabilitative programs for athletes of all skill levels. Specializes in developing custom foot orthotics for various types of athletes: Olympic, professional, collegiate and amateur. Senior member of the Medical & Health Advisory Board for the TPI located in Oceanside, California. He has treated and evaluated numerous PGA and LPGA Tour players; Anthony Kim, Mark O’Meara, Scott McCarron, Tommy Armour III, Ben Crane, Fred Couples, Padraig Harrington, Brad Faxon, Jason Bohn, and Jane Park (LPGA). He lectures nationwide through the TPI and helps golf professionals, medical and fitness professionals become certified as Golf Fitness Instructors. Master of Physical Therapy degree in 1998 and his Doctorate of Physical Therapy degree from Shenandoah University in December 2004. His history with TPI and Greg Rose, and how that spring-boarded into the golf-centric gym and 2-D & 3-D imaging. He also dives into the trials and tribulations of a pioneer as one of the first in the golf-fitness realm and watching it develop into what it is today. His work with the Discovery Performance Center being in charge of Fitness, Health and Wellness, and insight into the Discovery Land Company in their unique niche of the work they have done. He answers my questions on the importance of feet and orthotics for golfers and feet in the golf swing, and how the average golfer is overlooking their own feet when trying to improve their swing. His presentation at the World Golf Fitness Summit on back pain, describing and breaking down Tiger’s Fusion, and what is on the horizon for preventative measures and recovery for back pain like Eldoa and Foundation Training. A couple things that every golfer should be doing at a minimum on a regular basis to put themselves play better golf and live a better life, like proper hydration, spine exercises and the benefits of short High-Intensity Training. Any last piece of advice for the 18Strong Community? Create value in others lives and you will find value in yours.